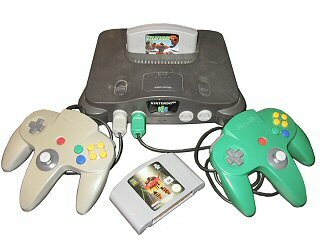 My first modern video game console was the N64, I got my first one second hand in Febuary 2000 at the tail end of the N64's retail life. For the collecter this seems to be a great time to get a console as it seems once the newer models have been released no one wants the older ones anymore and most stores discount remaining stock. During that time I managed to pickup a number of new games and accessories for a lot less than they used to sell for. The advantage being that in most cases you get mint boxes, and instructions for everything. Some of my favourite console games are on this system, and include Rogue Squadron, Pilot Wings 64, 1080 Snowboarding and Zelda: Ocarina of Time. I'm still a big fan of the N64 and I still keep my eye open for games I don't have yet.